Bird seed should be for the birds, but we all know intrepid squirrels love to steal any food lying around. Even caged bird feeders are often not immune to their wily ways. To help you find the best squirrel proof bird feeder, we’ve researched a variety of new and bestselling products. The result is the top ten reviews below for the best bird feeders that are squirrel proof. Now: Before we get started, here’s what you need to know when shopping. Dimensions: If you’re looking for an awesome bird feeder, you probably have a specific spot in mind. If it’s headed for the front porch, your favorite oak tree, or the garden behind your home, the dimensions are helpful information. Material: There is huge diversity amongst styles and designs of bird feeders. Wooden bird feeders, plastic, metal and more are all commonplace and can be found both in stores and online. We’ve noted the primary material for you here. Weight: Are you hanging your bird feeder from a branch? Or is it going to be sitting on a table? To help with placement decisions, we are including the weight of the bird feeder in pounds on our chart. Special Feature: Some high-quality bird feeders look like homes, while others are basic barred cages full of food. There are bird feeders made to satisfy all types, so we took the time to list a special feature from each of the feeders we chose. Capacity: If you're purchasing a bird feeder, you also need to buy the food going inside of it. Our capacity notation will help you in deciding how much you need to buy and store for later usage. We've marked capacity in pounds. Warranty: Plenty of things come with warranties, and the best squirrel proof bird feeders are on that list. We are placing every warranty and its length on our chart so you know if the item is replaceable when damaged or lost. 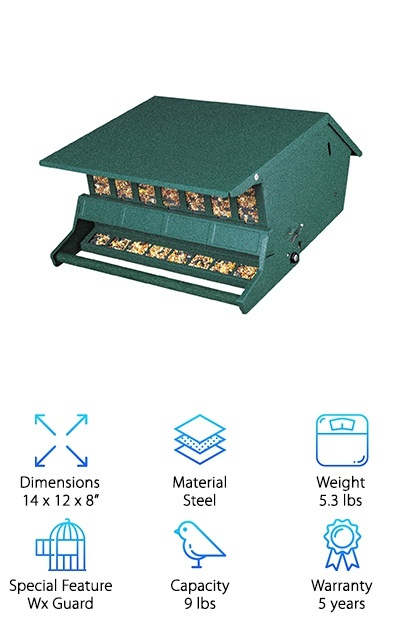 Now that you know what to look for when you’re searching through our squirrel proof bird feeder reviews, let’s get right to them so you can check them all out. Here's the deal: If you're in a hurry, go straight to our top pick and our budget pick. Both are excellent products and are among the very best feeders we found. If you're looking for the best squirrel-proof bird feeders, they are on this list. Let's get started! A cardinal feeders squirrel proof capabilities must be pretty impressive to foil those intelligent little critters. Our reviewers picked the Brome Squirrel Buster Plus because it will outsmart squirrels every time. How does it work? A weight-triggered mechanism is built into the feeder, which is made out of polycarbonate. When anything with the weight of a small, 4-ounce red squirrel or above hops onto the feeding ring at the base, the base shifts and the holes with access to the seeds close. Genius, right? Large birds like crows will also be turned away. Small birds like starlings and jays will happily surround the 6 feeding holes and feast. If there are in fact larger birds in the area you’d like to feed, you can increase the weight at which the seeds are blocked. The Brome feeder will hold over 5 pounds of seeds, so refills won’t need to happen too often. It comes with a limited lifetime warranty. 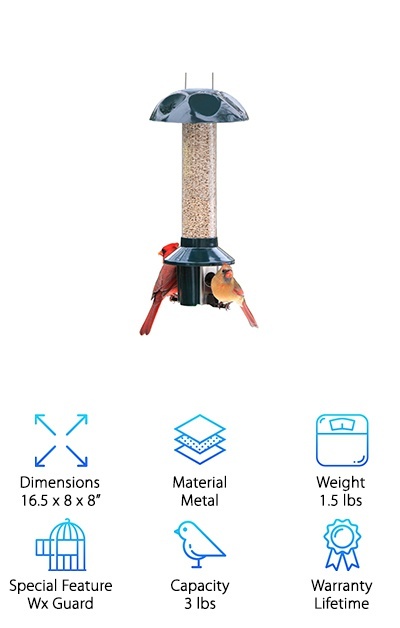 The ideal cardinal bird feeder provides them with food, and you with hours of enjoyment. You can watch common and rare breeds flock to your yard to enjoy a meal or a snack. One thing that can ruin a birdwatching session, however, is animals like squirrels. While they are also relatively harmless, they can make all of your birdseed disappear. 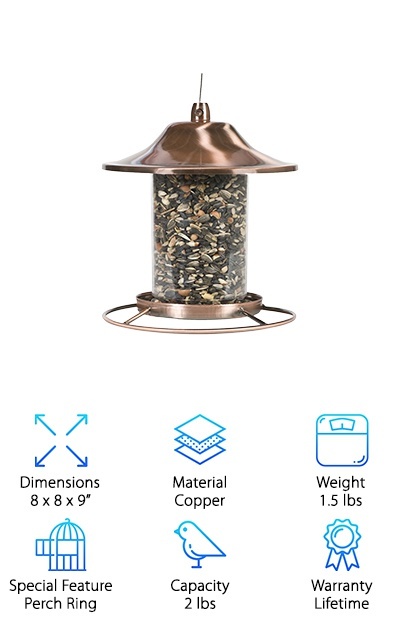 Our reviewers selected the Perky-Pet Copper Panorama Bird Feeder because it will keep those creatures away. And they won't be harmed! This feeder has a locked top cap that a squirrel cannot access. At the base is a circular perch and a tray-style feeding area, so birds can eat at all angles. It gets better: This is one of our most affordable selections. 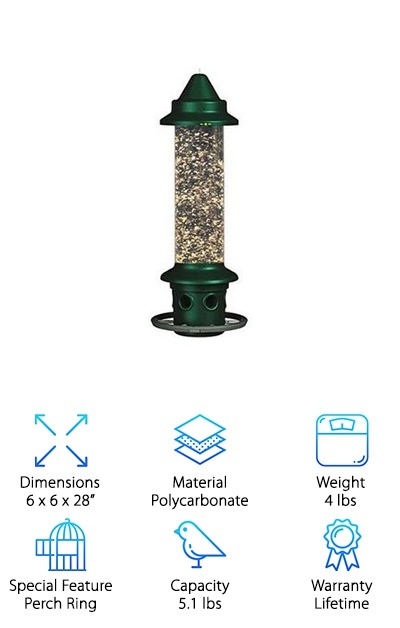 It weighs only 1.5 pounds and holds over 2 pounds of birdseed. It is made of copper, with an antique finish that will not rust easily. Finally, Perky-Pet products come with a limited lifetime warranty. Baby squirrels are adorable. They scamper around, acting cute all year long. That doesn’t mean, however, that you are OK with them eating your birdseed. 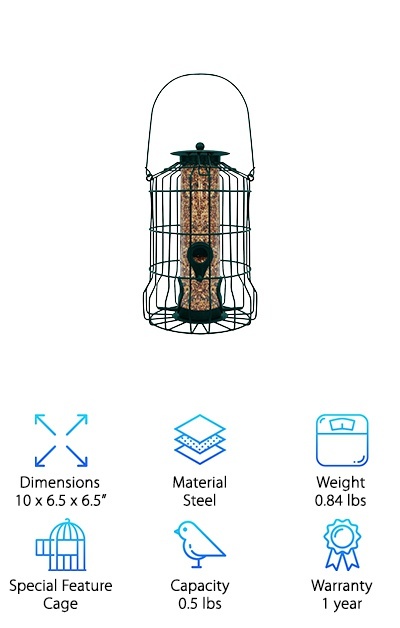 Your birdseed is for the birds, so protect it with the Roamwild PestOff Squirrel Proof Feeder. It's state of the art – it's got two spring-loaded bird perches, one on each side. If a red squirrel, a chipmunk or a rat jumps on board to steal a treat, the feeding port closes. Once the pest takes off, the port opens again to accommodate cardinals and bluebirds. Not only that, this feeder comes with a weather guard to keep the birdseed from getting wet and rotting. Even a little moisture can cause the seeds to swell, and for the ports to become clogged. You can pile up three pounds of birdseed for your little visitors, and the feeder opens up easily for cleaning. What’s the best part? A hassle-free warranty. Try the Roamwild feeder today! There are plenty of harm-free methods to keep rats, large birds like crows and other pests from accessing a new birdfeeder. One of the most popular things to do is to construct a cage around the feeder with spaces large enough only for small birds. Titmice, finches, and chickadees will all squeeze through the openings in the cage and eat. Medium-sized birds like cardinals can perch on the cage itself, and reach in. Squirrels will be unable to get to the seeds. Here's how it works: The cage itself is constructed from steel. It will last a long time, and it can't be chewed through. Once birds come through, they can feed at four different equally-spaced ports. You can load the feeder with 2.5 cups of mixed seeds or whatever else you'd like to put out. It's also easy to pop out of the cage and keep clean. You have a one-year warranty with the GrayBunny Caged Tube Feeder. Heritage Farms wanted to create a birdfeeder that offers great nutrition for the birds, and great views for the people installing it and enjoying it. That’s how they came up with the Audubon Bird’s Delight. It looks like a little greenhouse. It can be hung from a porch or a tree, or placed on top of a pole with the included pole mount. It is very sturdy, made from steel and colored a bright, happy blue-green. 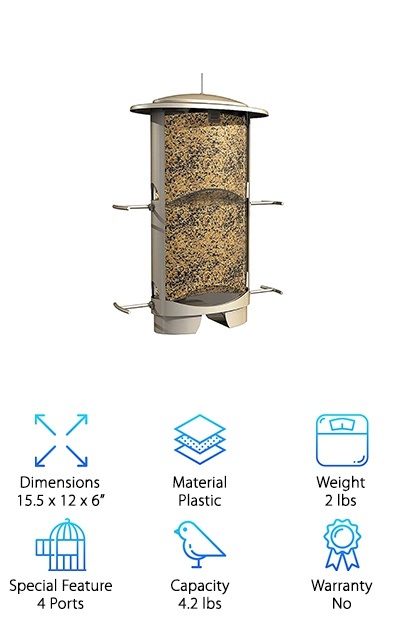 You can load it up with a whopping 9 pounds of bird seed, peanut halves or your feed of choice. This does in fact guard against squirrels, too. A weight-trigger mechanism closes access to the seeds when a large animal gets on the perch. This is a large birdhouse, measuring 14 by 12 by 8 inches, and it will provide you with a birds-eye view of the activity. The top ledge locks, and it overhangs to protect the seeds from wet rot. Did you know that there are over 4,000 species of songbirds known to man? That’s a lot of hungry birds, looking for a spot to rest. They cannot compete, though, with savvy squirrels accessing and eating all of their food. Try the More Birds Squirrel Proof Feeder on for size if this is a problem you’re dealing with. Finches and chickadees will love having four different ports to choose from. They will also likely appreciate the mechanism that closes every port when a squirrel lands on either a perch or the roof. The weight of the animal triggers metal closing doors. When pests are not around, birds can enjoy the feeder's 4.2-pound capacity for feed. Hang this feeder several feet in the air, and up and away from windows and relatively close to trees and bushes. That way, the birds won't fly into the glass, but they'll have cover for predators. You'll love the ingenuity and simplicity of this feeder! Sparrows, doves, blackbirds and all sorts of other small and medium bird species will flock to this feeder. They will love that the Perky-Pet No/No Bird Feeder can handle a crowd. It’s sturdy and made from metal, so it will hold up to 15 birds competing for a bite. What it will not accommodate are squirrels. 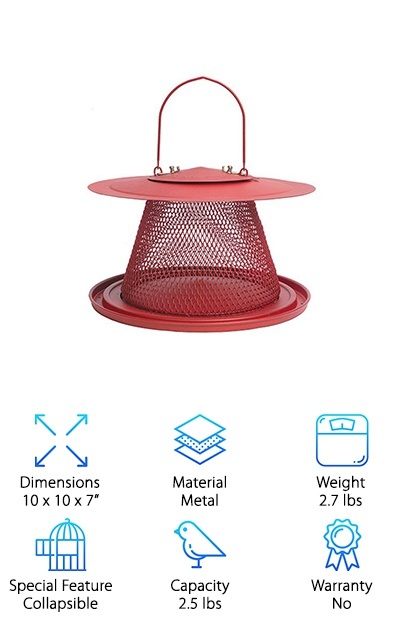 The metal mesh body, tray, and lid mean rodents and large birds will have a lot of trouble trying to get anything out of this feeder. They will likely seek food elsewhere. Meanwhile, little birds can hop onto the tray, or cling to the metal mesh. This bright red feeder can be filled with up to 2.5 pounds of seed. It's also easy to clean, and transport since it can be collapsed. The roof extension will also help to protect it from inclement weather. Whether birds are attracted by the color, the easy access to food, or the feeder’s shape, you will enjoy it all. There are regular birdfeeders, and then there are the birdfeeders that double as works of art and science experiments. That’s the BirdMaster Bird Feeder in a nutshell. It is a large see-through and hollow disk. Place the bird seed inside, and then mount it using suction cups up to a window. Birds will fly up, perch and begin to eat. They’ll do that while you, your kids and your cat sit and watch with rapt attention. The only other way to get this close to nature is at the zoo! (And this option is much more affordable.) 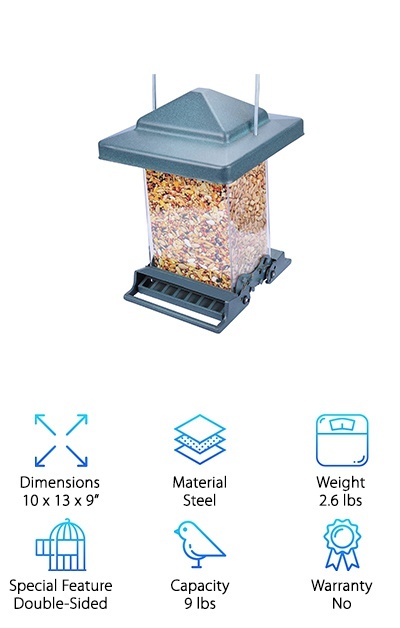 The BirdMaster Bird Feeder is also squirrel-proof. How? The placement – by placing this feeder in the center of a window, squirrels will have nothing to hang onto in order to grab some seed for themselves. Although the feeder looks delicate, it is actually quite durable. It is made of acrylic and will stay together for a long time. The material is virtually shatterproof! Squirrels are some of the smartest creatures on the planet. You know this to be true if one has ever stolen food from your picnic basket. They’re also always hungry! That’s why birdfeeders will become squirrel feeders if you’re not too careful. 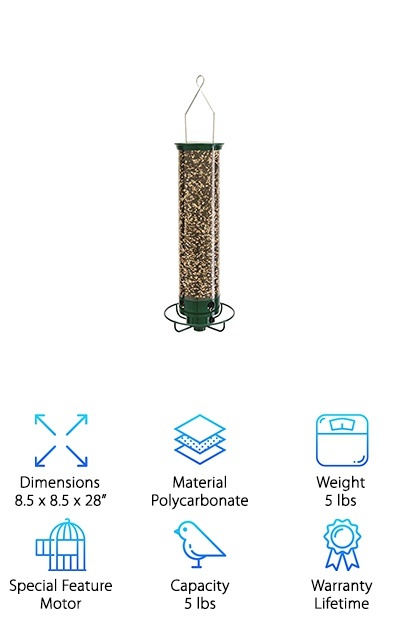 Eliminate the issue with the Myard ROCKET Large Capacity Tube Bird Feeder. Here's the scoop: This feeder is double-sided. Birds will find plenty of places to perch and have a meal. They'll be able to feast thanks to the 6-9-pound capacity acrylic body. The top and bottom are steel and will last a long time. It even comes with a metal hanger for easy placement. One of its best features is the one that will keep away the squirrels: The spring-loaded perches. They are sensitive to weight, and squirrels and rats will trigger them. Furry critters will soon learn they aren't welcome here! The perches can even be adjusted for weight if you'd like to make room for larger birds. Have you ever considered using an electric bird feeder to stop squirrels in their tracks? No, seriously! The Droll Yankees YF Flipper is a thing of genius. Here’s how it works: Birds, even medium-sized birds like doves, jays and cardinals will all love it. They can perch on the circular perch at the base of this tube-shaped feeder and munch away. But when a squirrel or a chipmunk hops on, the motor is triggered. The perch begins to spin, and gently relocates the little rascal! How’s that for innovative? (And amusing!) This is one of the larger feeders on our list. 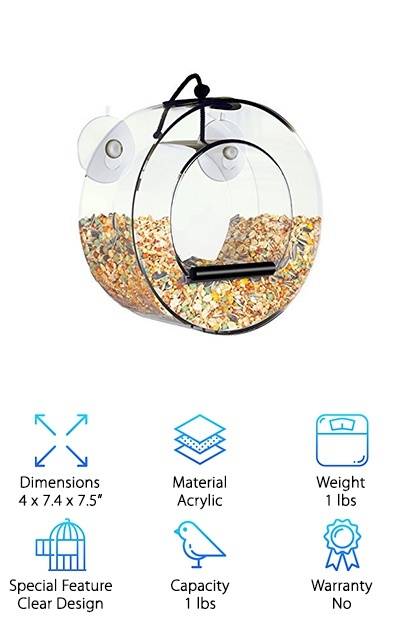 It can hold up to five pounds of birdseed! That means you’re going to get some beautiful visitors flocking to your window. The body is clear polycarbonate, so you can see when you’re running out. The heavy metal cap is another squirrel deterrent. You get a year-long electronics warranty and a limited lifetime warranty. Check out this innovative product!